Craig and Jim are teenage best friends, both nerds who love their favourite role-playing game, “Deadly Dungeons.” Jim is the game master who sets the scene for Craig’s character, an elven warrior named Vindyl, narrating stories of adventure that he shares with Jim’s character, an elf thief named Swift. One fateful day, Jim decides to make Vindyl wet his pants during a roleplay scene– and that begins an intriguing journey down a road of wet accidents for both imaginary character and real boy alike! 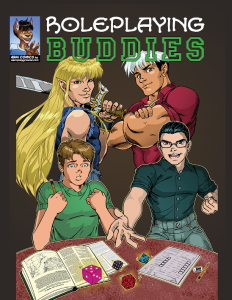 Can a roleplaying game change the real world of the two boys playing it? Find out in Roleplaying Buddies by Karis’ Playground, on sale in digital or print format at lulu.com!